The winning photograph, "Voter with Disability Cast his Vote at Pilkada Takalar 2017" by Maman Sukirman of Koran Sindo, is pictured above. The article below was selected as the winner for the News reporting category. Winning and runner-up submissions can be viewed here. This article originally appeared in Pilkada on 17 February 2017 and can be viewed in Bahasa Indonesian here. 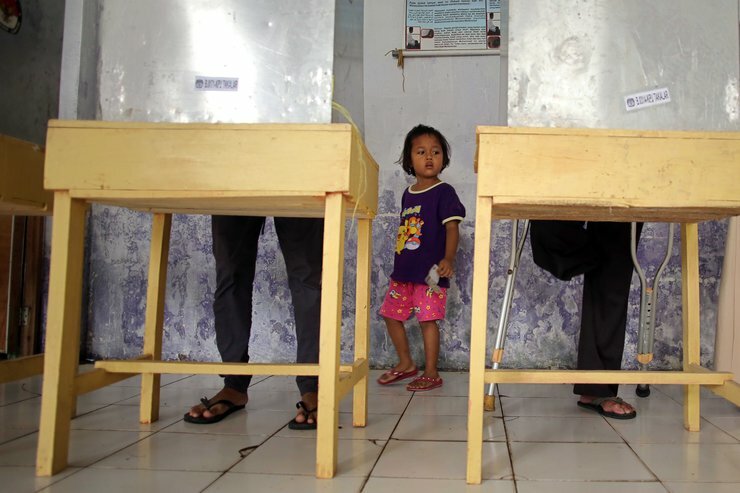 Electoral management bodies have been increasingly more serious in making elections in Indonesia, so that those with disabilities will be able to fulfill their rights to vote without barriers. However, not all parts of the great regulations promulgated were transformed into ideal practices, particularly for those with psychosocial disabilities. It was early in the morning, Wednesday (16/2). The early-bird voters of Polling Station 11 in West Cengkareng had begun to arrive to vote in DKI Jakarta Gubernatorial Election 2017. Physically, the humble polling station did not show anything extraordinary. However, a closer look at the polling station’s voter list revealed that according to the National Election Commission’s voter data, this polling station’s voter list contains the biggest number of voters with disabilities among all polling stations in DKI Jakarta. Out of 711 voters registered in this polling station, 397 are with disability. A polling station staff explained that the high number of voters with disabilities was due to having Bina Laras Harapan Sentosa 1 Social Care House only several hundred meters away from the polling station. Despite so, no voters with disabilities showed up even though the day was nearing afternoon, when the polling station’s closing time is almost due. The iron gates into Bina Laras Harapan Sentosa 1 Social Care House were ajar. We went in and spoke with Eko Purwanto, the caretaker of the social care facility that accommodates around 900 persons with psychosocial disabilities. Mr Purwanto explained that none of the social care house community members went out to vote because their right to vote was revoked. Mr Purwanto proceeded to invite us into the facility, for us to witness that none of the facility’s community members had left the facility to vote. The atmosphere in the inner courtyard was festive. There was a gazebo, in which a man sang joyously along music blaring out of a loud speaker. Hundreds of those with psychosocial disabilities sat on the floor: some were listening intently to the singer, some even nodded along the rhythm of the music. Ms Mis, another caretaker, explained that initially, 473 community members were registered in the Fixed Voter List, registered by the facility’s previous head. Some of these registered voters then died or moved out with their family, leaving only 292 remaining names. Unfortunately, the facility’s current head revoked all of their names from the Fixed Voter List. “The head did not want to be blamed; they deem those with psychosocial disabilities as inherently incoherent,” said Ms Mis. A person with psychosocial disabilities is legally defined as someone bearing a disability affecting their cognition, behavior, and emotions, displayed through specific symptoms preventing them from being fully functional in physical, mental, spiritual and/or social terms. Article 57 paragraph (3) letter a in Law 8/2015 governing Regional Head Elections stated that one of the prerequisites to be registered as a voter is “not having their mental or memory function impeded.” Constitutional Court then proceeded to annul this regulation, arguing that those with mental or memory-related disabilities are still eligible as voters. Unfortunately, facts are not always as ideal as expectations. This ruling by the Constitutional Court is difficult to implement. The conditions of those with psychosocial disabilities tend to fluctuate and undulate between better and worse episodes. The assessment of whether a person with psychosocial disabilities is deemed stable enough to vote is fully given to mental health experts or social facility caretakers. This case in Bina Laras 1 is just the tip of the iceberg when it comes to the difficulty of streamlining the policy of facilitating the constitutional voting rights for Indonesians with psychosocial disabilities. Basic Health Research Report issued by the Ministry of Health in 2013 revealed that in Indonesia, 1.7 out of 1,000 citizens have psychosocial disabilities. This article referred by Helmiaty Bakrie has actually been made redundant – even later laws have been annulled by the Constitutional Court. “As the revocation request was made by a caretaker of a mental health facility, we weren’t able t reject it,” said West Jakarta Election Commissioner Cucum Sumardi. Not all voters with psychosocial disability met the same fate. Piki (17), born bearing mental retardation, beamed proudly as he showed his inked pinky – an official sign that he had cast his vote. Along with other 22 friends from Bina Grahita Social Care Facility, Piki cast his vote in Polling Station 44, Pegadungan Sub-District, Kalideres, West Jakarta. Each of them were assisted by a caretaker who helped explain using simple language the mechanism of casting their vote: how to open the ballot, take the pen, punch the ballot to indicate their vote, and then fold it back into secrecy. “If folded incorrectly, we as caretakers would help, but none of us entered the voting booth,” said Ade, a caretaker. This procession created a bit of a jam in the polling station, but nobody complained. “Instead, I was moved. These citizens with disabilities went all the way to the polling station to vote – it showed their great interest in the democratic process,” said M. Yamin (45), a fellow polling station attendee. There were actually 27 registered voters with psychosocial disabilities in Bina Grahita, unfortunately four weren’t able to go out to cast their vote as their condition during the voting hours were not stable. On 12:30 p.m., half an hour before the polling station closed, a number of polling station staff visited Bina Grahita to see if the condition of the four voters had improved, unfortunately that was not the case. One was not able to respond and instead ignored everything when engaged in a talk; some refused to talk and instead babbled incoherently and began acting out violently. Ade said, “we, caretakers, and the polling staffers, along with the witnesses and Election Supervisory Body watchers agreed not to force the four voters to vote.” According to Irmansyah, a lecturer on mental health from the University of Indonesia, deciding whether someone with psychosocial disabilities is stable enough to vote necessitates a routine and gradual evaluation. The social facility must provide adequate caretaking for those with psychosocial disabilities when about to cast their vote. If not stable enough to be taken out of the social care facility, some polling station staff can visit the social care facility. “Otherwise, not allowing them to vote is an act of discrimination that directly violates the spirit of our constitution,” said Irmansyah. National Election Commissioner Hadar Nafis Gumay stated that his institution stands by the founding principle that voting is a fundamental right of every citizen, including those with psychosocial disability – such is why the National Election Commission (KPU) included them in the voter list. If other parties decide to report against their inclusion in the fixed voter list, the KPU has no option but to take their report into account. “What we need to do is to specify the rule in order to prevent arbitrary or varying practice of the regulation,” said Commissioner Gumay, hoping that the future sees no more violations against the constitution right to vote for voters with psychosocial disabilities.